The International Federation of Journalists (IFJ) and the European Federation of Journalists (EFJ) together with professional journalism organizations of Ukraine condemn the verdict delivered by the Moscow City Court to Ukrinform journalist Roman Sushchenko. This is stated in a statement by the federations of journalists. "The IFJ-EFJ joined its affiliates the National Union of Journalists of Ukraine (NUJU) and the Independent Media Trade Union of Ukraine (IMTUU) in condemning the harsh verdict and in urging Russian authorities to release Sushchenko until thorough evidence of the allegations against him has been presented," the statement reads. 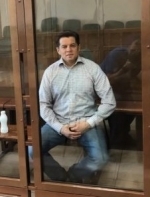 As reported, on September 12, the Russian Supreme Court upheld the verdict delivered by the Moscow City Court to Ukrinform journalist Roman Sushchenko, who was sentenced to 12 years in a high-security penal colony. Ukrinform's Paris-based correspondent Roman Sushchenko was illegally detained on September 30, 2016 in Moscow, where he arrived on a private trip. On October 7, 2016, he was charged with "espionage." Russia's FSB claimed that Sushchenko is a member of the Main Intelligence Directorate of the Ukrainian Defense Ministry. The latter denied this allegation.